The Bijay Mandal was built in the 14th century by Allauddin Khilji with some additions by the Muhammad bin Tughlaq. The entire structure, mostly in ruins stands on a raised platform, with another higher platform on it, built in the typical Tughlaq architectural style. 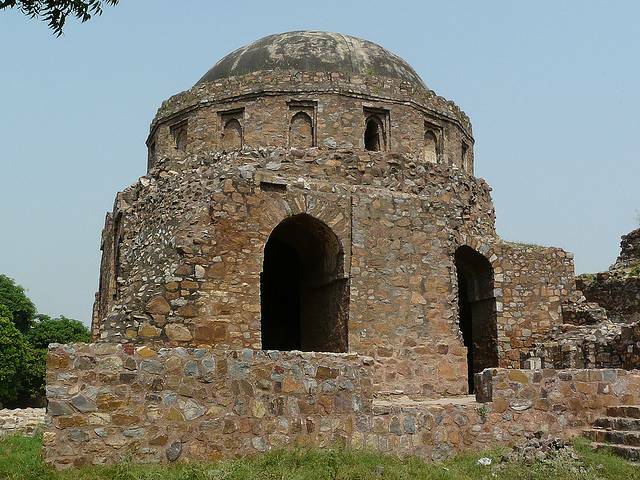 The huge complex of the fort is a part of Jahanpanah, which was one of the four cities of erstwhile Delhi Sultanate. Once upon a time, it was the site of the famous thousand-pillared hall with an exquisitely carved roof. Very little remains of the actual structure. A set of steps leads to an octagonal pavilion on the roof. Here, at a height of over 150 feet from the ground, the view of Delhi is startlingly magnificent. The fort encapsulates a rich historical background since it is mentioned in the ‘Ibn Batuta’ writings. Those in search for peace and quiet in the overtly crowded National capital would love this place that is drenched in rich historic importance.